The 4*Philippe le Bon Dijon l comprises of 3 buildings grouped together and dating from the 15th Century. It offers 32 spacious guestrooms, which are decorated with a mixture of antique and modern furniture, giving a homely feel. The restaurant serves excellent regional food and has an extensive and exquisite selection of wines. 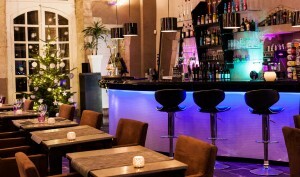 Situated in a quiet street in central Dijon, the hotel is located close to the city’s restaurants, bars and shops. Its slightly set-back location allows peace and tranquillity whilst remaining just a few minutes’ walk to the city centre’s amenities. The hotel’s warm and welcoming atmosphere ensures a very pleasant stay and for those that do not wish to go out in the evening, the hotel’s gourmet restaurant, “Les Oenophiles” offers an inventive menu with seasonal products and a trendy cocktail bar is also available on site. During the summer months, a Gothic courtyard is a charming place to enjoy an aperitif and lunch and dinner can also be served in the beautiful garden. For those who are driving to Dijon, private car-parking facilities are available for 8 Euros per day. Each of the 32 rooms are air-conditioned, with a mini-bar, cable TV and internet access. 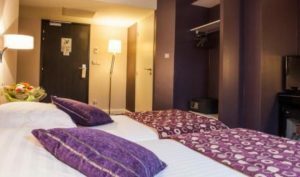 The Standard rooms are cosy and comfortable, whilst the Superior rooms are more spacious and have recently been refurbished. The en-suite bathrooms have recently undergone a complete renovation and are modern-styled and spotless. The hotel also offers a third room grade for further comfort and a range of Junior and Luxury suites.